Rental includes gun, mask, and some ammo. Limited rentals on hand, call 888-316-7816 to prepay and reserve rentals in advance. First come first serve on any unreserved rentals. Click Here to Reserve Rental Equipment! Click Here for a Group Reservation! When you play at FAF, you are committing yourself to following the rules below. Airsoft is a sport of honor and everyone playing should conduct themselves to a higher standard in order to make sure we all have a good time and so that the sport can grow! After paying for admission and signing your waiver, you will proceed to the chronograph area as soon as you are ready. Please keep your eyewear on when in the chronograph area. Players who are using our rental guns DO NOT NEED TO CHRONO. 1.5 Joules (400 FPS with a .20g BB) - AEG (Full & Semi Auto) - No Minimum Engagement Distance / Use Semi-Auto within 10 feet. 1.5 Joules (315 FPS with a .32g BB) - HPA (Full & Semi Auto) - No Minimum Engagement Distance / Use Semi-Auto within 10 feet. 1.5 Joules (400 FPS with a .20g BB) - Pistols & Shotguns (Full & Semi Auto) - No Minimum Engagement Distance / Use Semi-Auto within 10 feet. 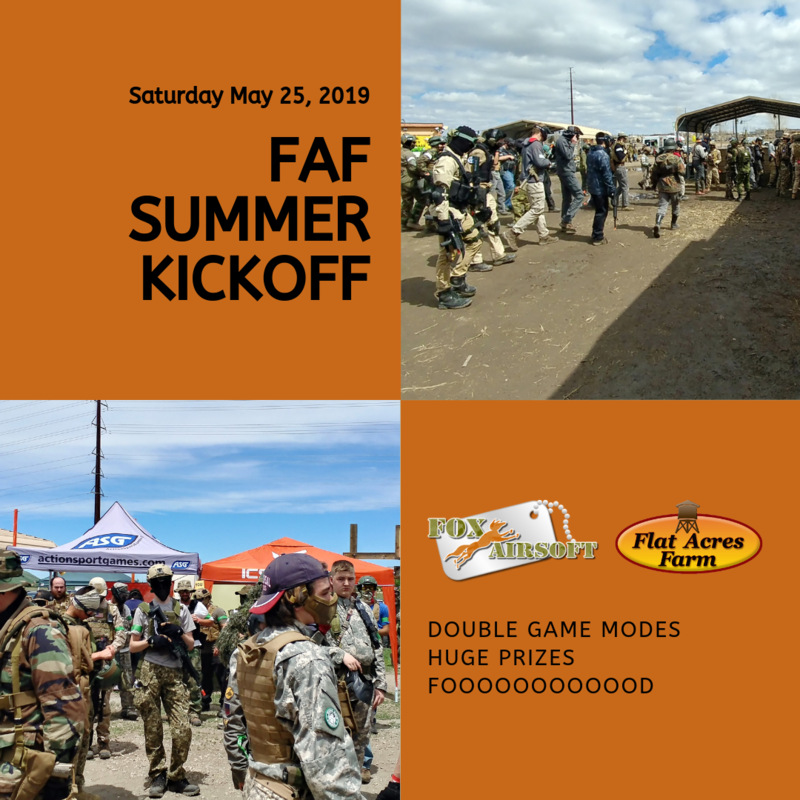 Flat Acres Farm Airsoft (FAF for short) is an airsoft field in Parker, Colorado. It features 3 outdoor playing fields which we cycle through so you can play many different ways in just one location. We run multiple game types to keep you challenged. CQB field - Up close and personal action with tight corners and very confined spaces. Running pistols, SMGs, shotguns, and short rifles is recommended here. You may run only semi-auto on this field and no sniper rifles allowed here. Urban field - Large open area with plenty of cover and obstacles. This has a good balance of distance and close quarters battle so you can play this field many different ways. All weapon types are permitted here as long as you observe the correct minimum engagement distances. Large field - This is a wooded area with lots of trees, tall brush, and a lot of man-made cover and fortifications. This is where we play our larger scale objective games. All weapon types are permitted here as long as you observe the correct minimum engagement distances. As of this moment we currently operate on Saturdays from 8AM to 3PM. It is recommended that you show up early to get your value. The first games are scheduled to run at 9AM. We do close during October for fall festivities on the farm, but then we're right back at it after Halloween! For players looking to come out and experience airsoft for the first time, we offer rental equipment to get you started. Rental equipment is limited and on a first come, first serve basis. You may however reserve your equipment by calling us at 888-316-7816 and paying in advance to guarantee your rental. Reserving in advance is highly recommended as we can sell out very quickly. Dress in clothes that cover your body and don't mind getting dirty in. Additional protective gear is not provided so it is recommended that you wear long pants and long sleeves for more protection. Games run on scheduled intervals so showing up during a scheduled game could mean you will be waiting a few minutes for the next round. Be on time and check the posted schedules on the field to get the best value. Games typically run about 15-40 minutes long with a brief 10 minute intermission between rounds. Spare ammo, additional and supplies are offered for sale at our mobile shop. For full service needs please visit Fox Airsoft on 10244 Progress Lane 10 minutes away. Beverages are also available for purchase.